Celebrate your graduate as they graduate from high school, college or university! To help you plan the perfect graduation party, here are DIYs for everything you will need for the event, including decorations, party favors and centerpieces. Create some fun photo ops at the graduation party with a chalkboard speech bubble–a perfect photo prop. One great way to help keep guests entertained, is to set up a photo booth and invite everyone to take pictures with the speech bubble. You can ask your friends and family to tag it on social media with your party's hashtag. Before your graduate arrives, hand out confetti cones to everyone at the party, so you can all welcome the graduate with showering confetti. Making DIY graduation cones is super easy, just print the free template, roll them into a cone and fill them with confetti. It really could not be any easier! Decorate all your cupcakes with mini graduation caps by making these easy cupcake toppers out of black card stock. Leis are traditionally given as a gift when someone is arriving or leaving, which is why they are perfect for new graduates to wear to symbolize the arrival to a new stage in their lives. Instead of the traditional flower leis, you can make this fun candy version. 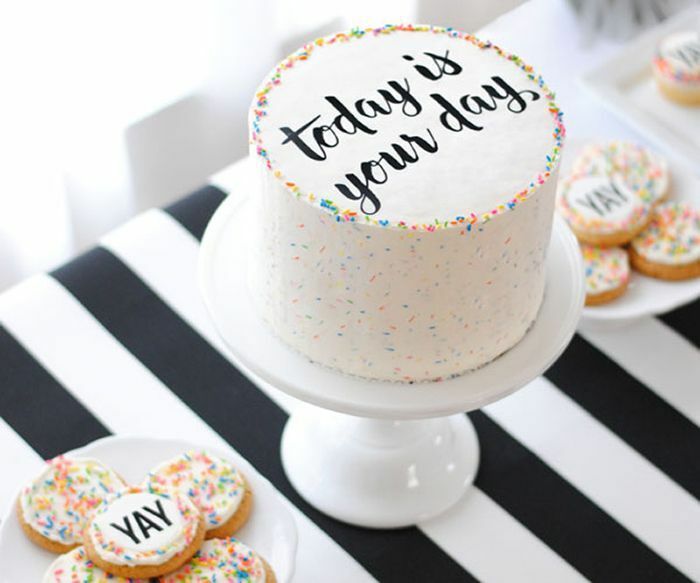 Skip the tedious step of trying to carefully write a message in icing on top of the cake, and learn how you can use this printable cake topper instead. Decorating a cake has never been so easy! String a photo of the graduate to the bottom of a helium balloon in this DIY; do this several times to create a colorful cluster of balloons and photos. The floating photo memories are the perfect way to decorate your home for a graduation party. Your graduate can decorate his or her cap with a quirky or meaningful message. This will also make it easier to locate which cap is theirs when all the graduates ceremoniously toss their caps into the air! Cut the graduation year out of a large sheet of paper and attach the numbers to a giant balloon for a quick but effective way to decorate for your graduation party. Adorn a graduation cap with tissue paper flowers for a beautiful accessory for the new graduate to rock at her party. Customize your balloons with paper letters, spelling out words or phrases, such as hooray. Spruce up your cupcakes with DIY chalkboard wrappers. You can write the graduation year, the graduate's name or anything you'd like! Confetti is the ultimate sign of a celebration! Decorate your party with this DIY confetti covered banner. Welcome everyone to the party with a colorful paper lei! Turn any ordinary drink look into a fancy custom cocktail with graduation cap straw toppers made with from card stock. Bonus points if you serve your beverages in mason jars. For the perfect centerpiece, make your own "yay" vase, which you can fill with bright and cheerful flowers, further accentuating the sentiment of the celebration. For a whimsical snack table centerpiece, cut the graduation year out of cardboard and cover it in sprinkles! Graduation signifies the start of a new adventure, whether that's a celebratory vacation, college, or a new job. These DIY "adventure awaits" cupcake pennants communicate the perfect sentiment to your graduate and their friends. This printable pennant banner is perfect for decorating on a budget. Just print the free template, and string the paper flags together for quick and easy party decor. Have leftover wine bottles? Paint them gold and stick the graduation year on top for the perfect graduation party centerpiece. Cut out paper triangles in rainbow hues or your graduate's school colors. Hang them all around the party to brighten up your decor. Keep your graduation party guests entertained with a photo booth, complete with props. These DIY speech bubbles highlight commonplace senior superlatives like "Class Clown" and "Most Likely to Succeed." Marquees continue to be a trendy way to decorate, and you can create a balloon marquee to spell out a message on a wall with this excellent DIY idea. Instead of buying large paper fans, you can save money by making your own. These are so fun as party decor for any event! Nothing says "party" quite like balloons! Create a dramatic focal wall at your party with tons of balloons. Your Instagram-savvy graduates will appreciate the perfect photo background! Don't bother trying to pipe your own hand-drawn caps onto your cupcakes, as black icing often tastes horrible. Instead, top each cupcake with a DIY paper topper. Thank all your family and friends for attending your son or daughter's graduation party with a graduation themed party favor. This mini tube of gum balls is adorable topped off with a mini graduation cap. Treat everyone at your graduation party with these adorable chocolate Rolos decorated with paper graduation hats. Serve them on a tray or package them up to give as party favors. Decorate your front door with a DIY graduation wreath made up of photos of the graduate. Fill up plastic fillable light bulbs with neon-colored candy. Tie on the printable labels and you have the perfect gift for your graduate and all their friends in just a few minutes time.